Let RFDS supply a comprehensive component-level network design & engineering rendering for your private paging network, then complete a field installation with remote network monitoring & diagnostic troubleshooting. RFDS will evaluate and document your network and recommend actions that protect your programs and investment. Custom Design and mapping of your RF Environment, detailed item pricing, manufacturer & component selection, and other tools provide our clients with critical information required to manage their programs properly. We build what we design. Oversee and take responsibility for each construction phase of your project while conforming to your company’s security, safety and insurance guidelines. Our Predictive Network Alarming solutions identify network problems. We use Dynamic signal strength & performance evaluation, diagnostic troubleshooting, message archiving, and other tools to deliver confidence. 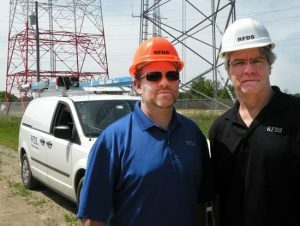 In addition to Utility Demand Response, RFDS is experienced with; 900Mhz, VHF & UHF 1-way paging networks. Backhaul designs using Satellite, RF Link, IP, Cellular and others. Simulcast upgrade & conversions. Headend upgrade & back-up. And more. Our proprietary network designs use modern components to broadcast new and old protocols. RFDS partners with dozens of component manufacturers to deliver the best solution for our customers. When the job is done, RFDS can help you keep the network in great shape, making changes and updates as required. Ask us about our Long Term Maintenance Agreements.